Reading and share top 8 famous quotes and sayings about Napoleonic by famous authors and people. Browse top 8 famous quotes and sayings about Napoleonic by most favorite authors. 1. "Oh, I'm nerdy about science fiction and fantasy and graphic novels and reading, and I'm nerdy about board games. My favorite board game is a board game I'm working on right now. It's a game of Napoleonic era naval warfare, and it's going to be fun." 2. "There's no present left. This is the problem for a novelist. [The problem] is the present is gone. We're all living in the future constantly . . . Back in the day Leo Tolstoy -- what a sweetheart of a count and of a writer -- in the 1860's he wanted to write about the Napoleonic Campaign, about 1812. If you write about 1812 in 1860, a horse is still a horse. A carriage is still a carriage. Obviously, there are been some technological advancements, et cetera, but you don't have to worry about explaining the next killer [iPhone] app or the next Facebook because right now things are happening so quickly. 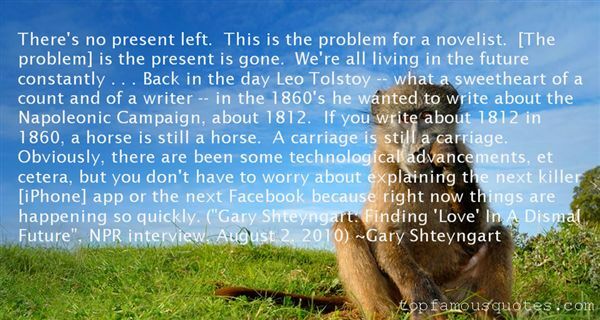 ("Gary Shteyngart: Finding 'Love' In A Dismal Future", NPR interview, August 2, 2010)"
3. 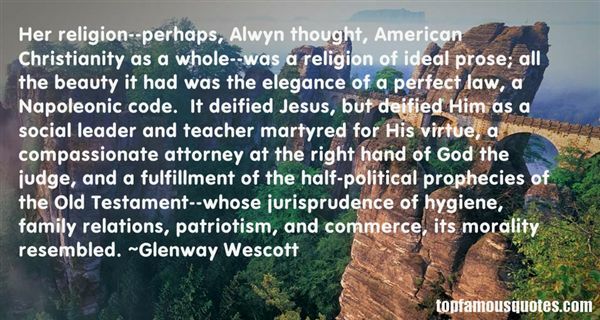 "Her religion--perhaps, Alwyn thought, American Christianity as a whole--was a religion of ideal prose; all the beauty it had was the elegance of a perfect law, a Napoleonic code. It deified Jesus, but deified Him as a social leader and teacher martyred for His virtue, a compassionate attorney at the right hand of God the judge, and a fulfillment of the half-political prophecies of the Old Testament--whose jurisprudence of hygiene, family relations, patriotism, and commerce, its morality resembled." 4. 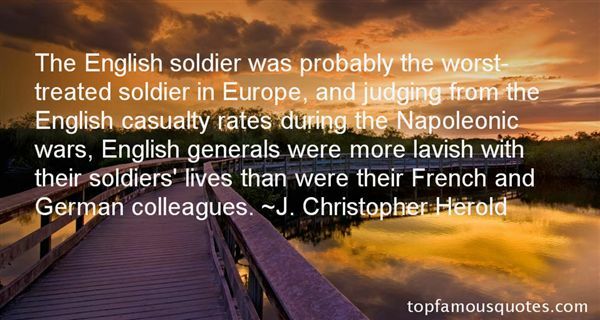 "The English soldier was probably the worst-treated soldier in Europe, and judging from the English casualty rates during the Napoleonic wars, English generals were more lavish with their soldiers' lives than were their French and German colleagues." 5. "...those who have no money blame and blame and blame themselves. This inward blame has been a treasure for the rich and powerful, who have had to do less for their poor, publicly and privately, than any other ruling class since, say, Napoleonic times." 6. "But the tale or narrative set in the past may have its particular time-free value; and the candid reader will not misunderstand me, will not suppose that I intend any preposterous comparison, when I observe that Homer was farther removed in time from Troy than I am from the Napoleonic wars; yet he spoke to the Greeks for 2,000 years and more." 7. "So, what's the story? ""No story. Just a nightmare.""Meaning? ""Meaning, heavy compression lines in his cartilage, severe bruising on his kidneys, liver and lower intestines. Fracture marks on his collar bone, tibia, radius, humerus, scapular, femur and every single one of his ribs have been broken. Don't even get me started on the concussive damage to his skull and brain tissue. Twenty-three percent of this boys body is scared for life. And yet, every organ is functioning normally and his neurological activity is above average. He's eighteen years old and he weights about two bills but remove the scar tissue and he'd weigh about a buck-ten. All in all, I say he lived inside a hydraulic car press, went through the Napoleonic wars and was on board the Hindenburg when it went down in flame and yet he's okay...this boy just refuses to die." 8. "But I can no longer ready any faith's Napoleonic saber rattling without picturing smoking rubble on cable news. I guess if I had to pick a spiritual figurehead to possess the deed to the entirety of Earth, I'd go with Buddha, but only because he wouldn't want it." You must be one of the few people with a copy of that. I don't think they printed too many."